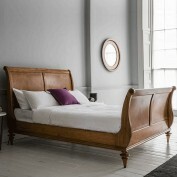 Enjoy a classic look in your bedroom with this beautifully crafted Geneva sleigh bed. Carefully handcrafted from solid ash with elegant, walnut veneers and sprung wooden slats, this luxurious sleigh bed has a refined appearance thanks to its turned legs, delicate curves and gorgeous panelling. Substantial yet elegant, the handcrafted Geneva sleigh bed will transform any bedroom into a private paradise.